Apple controls the whole ecosystem – iPad, IDE, and language. Well ya okay technically Swift is open source, but at least Apple controls the hardware and the IDE. The hardware being the iPad, and the IDE being the Swift Playgrounds app. Just like they’ve done for years, by controlling the whole ecosystem, Apple gets to ensure a top notch experience. iPad learning – Learning on a tablet, an iPad to be specific, will appeal to a much wider audience in a much wider set of circumstances. Ya the iPad has lost some appeal lately, but despite that, I foresee huge sections of people in new age groups using Swift Playground Books to learn the Swift programming language (not just “kids”). 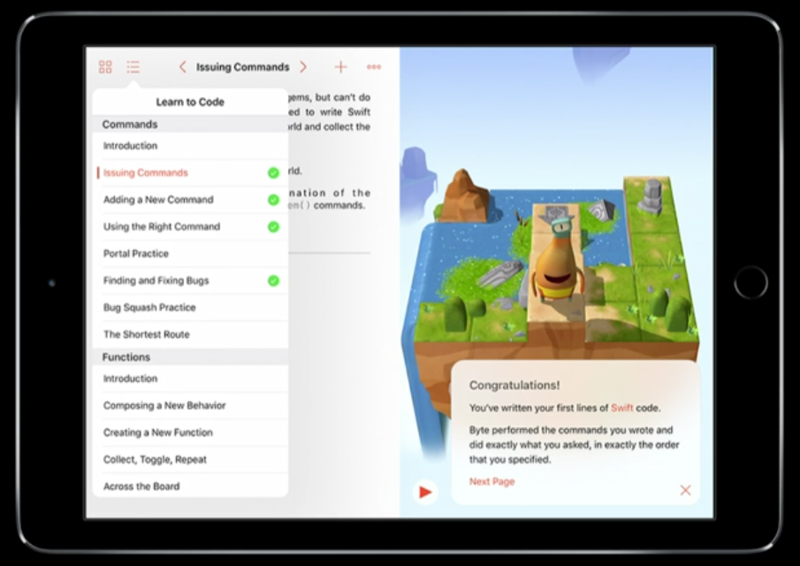 The new iOS 10 iPad app, Swift Playgrounds, is pretty cool on its own. Awesome autocompletion, touching and dragging brackets around, immediate feedback on written code, and more all contribute to a whole new way of programming. I’m not going to rehash the app in detail, this blog has a nice summary, and I also suggest watching the WWDC 2016 session “Introducing Swift Playgrounds”. (The last 10 minutes are super cool where a Sphero robot is controlled from an iPad, live on stage). We can’t actually create apps in Swift Playgrounds yet, so until then, Swift Playgrounds is pretty much designated an exploratory and educational tool, and I’m okay with that. Regarding informal exploration of the Swift language, I see a lot of this happening in one-off playgrounds themselves. A standalone playground file is the perfect resource to try things out, learn about a specific topic, and just have fun. Swift Playground Books though is a giant step forward in organized and collated learning. 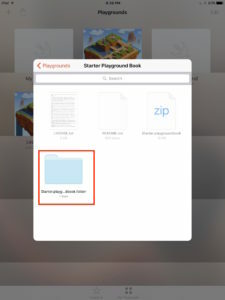 Rather than just consuming a single playground, Swift Playground Books allow authors to aggregate content into an actual book-like, yet interactive experience. Playground Books support a nested chapter and page structure, just like a real book. Additionally, there’s a cool new type of “page” called a cut-scene. Imagine that you complete a chapter in the book, and as a reward get to watch a little animation celebrating your victory, while also setting up the next challenge. As an author, you can also programmatically designate assessments on a chapter – did the user complete it successfully? This shows up in the Table of Contents as a green checkmark. Glossary – You can link terms at the tap of a finger. Regions – Annotate pieces of code so that the user literally only needs to fill in specific parts to complete the challenge. Shortcuts – Control what shows in the Helper Bar. Hints – After the user has provided a response, if it isn’t quite correct you can code a “hint” to be displayed. Resetting – The reader can either reset a page, or the entire document to start all over. Live View – You can trigger a Live View to interact with that takes up half the screen. The idea is that the user writes code on the left hand side of the window – the Contents View, while interactive results are displayed on the right hand side – the Live View. (There are actually some specific APIs to use in order to pass data back and forth between the Contents View and the Live View. See PlaygroundLiveViewMessageHandler, PlaygroundValue, and PlaygroundRemoteLiveViewProxy. Swift Playground Books are easy to create. They are literally just a folder, with a particular structure, and a couple configuration files. Check Apple’s official documentation for details on setting up the directory and file structure, it’s dead simple. And since it’s all just text and folders, it can be version managed just like any other code or project! Despite it being simple, I’ve had some issues getting it actually working on iOS 10 Developer Beta 1 and 2. For some reason, Swift Playgrounds isn’t recognizing my Swift Playground Books as something it can read. Instead, it just lets me browse the directory hierarchy, never actually opening it as a Swift Playground Book. 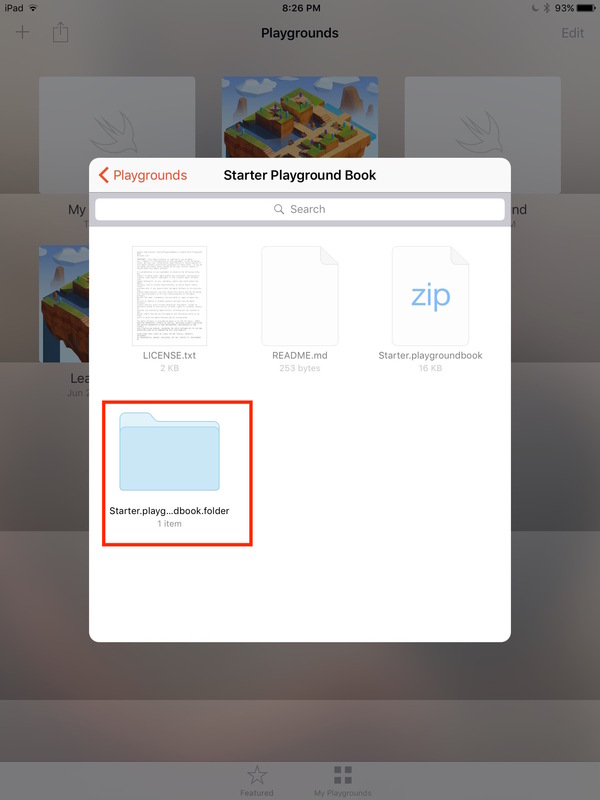 This folder should be detected as a Swift Playground Book that may be opened. Apple even recognizes the .folder extension in their documentation as something expected, and something that should be there. Maybe it’s just too early of a beta, or maybe I’m having problems since I’m trying to create these on OS X El Capitan rather than Sierra? I’ll continue to dig and post and update when I figure it out. 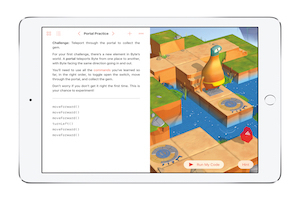 One thing on my mind is whether Apple will provide some sort of store front for the Swift Playground Books. I could see significant effort and time spent on developing complex books that could provide hours of entertainment and learning for end users through discovery within a Swift Playground Book. It’s certainly a ripe business opportunity. Right now, there are only two tabs in the Swift Playground app: Featured, and My Playgrounds. I wonder if they will eventually create a store front to purchase Swift Playground Books through? And if so, will be be protected my DRM at all? 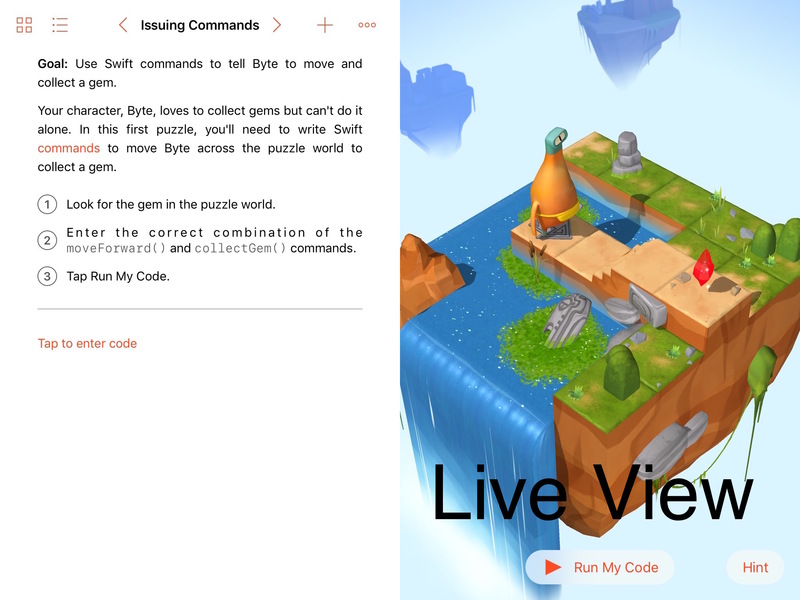 I have so many ideas for content to create and distribute in Swift Playground Books. And besides that, I can’t wait to sit on the couch with my kids and reveal the amazing world of computer programming to them through Swift Playgrounds. How about you? Did you succeed in opening the SP book into Xcode yet? Ditto to Joe Moretti – I can export from the app, but it doesn’t seem to run like a program when I open it in xCode.